Get high performance filtration for your oil system with Royal Purple Oil Filters! 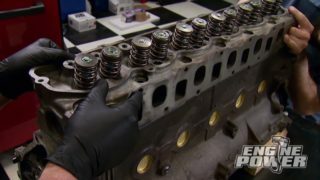 (MIKE)>> WELCOME TO A BRAND NEW EPISODE OF ENGINE POWER. TODAY WE'RE GONNA LET THE CHASSIS AND BODY OF OUR '73 TRIPLE THREAT CAMARO PROJECT TAKE A LITTLE REST. THE LAST TIME YOU SAW WE PICKED THE CHASSIS UP FROM STREET ROD GARAGE, HAULED IT TO MISTER SPEED COATINGS WHERE IT GOT SOME KILLER POWDER COATING WORK DONE. THEN BROUGHT IT BACK HERE TO THE SHOP WHERE WE ASSEMBLED THE REAR END, ALL THE SUSPENSION, AND FINISHED IT OFF WITH A BIG BRAKE KIT FROM WILWOOD. (PAT)>> TODAY IS ALL ABOUT THE TRIPLE THREAT BULLET. WE ARE GONNA ASSEMBLE THIS ENGINE AND GET IT STRAPPED TO THE DYNO TO SEE HOW MUCH POWER THIS POTENT COMBINATION WILL PUT OUT, AND WE ALSO HAVE A PLETHORA OF PERFORMANCE PARTS FROM TOP MANUFACTURERS. SO WE CAN OPTIMIZE THE OUTPUT OF THIS 440 INCH COMBINATION, AND WE'VE ALREADY DONE A BUNCH OF WORK TO IT. TAKE A LOOK! WE STARTED THE BUILD WITH A WORLD PRODUCTS MOTOWN LS IRON BLOCK. 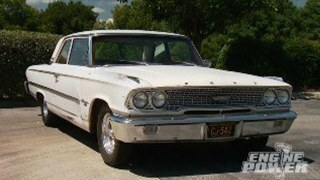 IT'S A BLEND OF ORIGINAL SMALL BLOCK CHEVY DESIGN DOWN LOW WITH A DECK THAT ACCEPTS LS CYLINDER HEADS. THIS ONE HS 350 MAINS, A FOUR-185 BORE, AND THE CAM TUNNEL IS RAISED 134 THOUSANDTHS FOR EXCELLENT VALVE TRAIN GEOMETRY. THE CRANK SHAFT IS AN EAGLE SPECIALTIES 43-40 FORGED STEEL PIECE WITH A FOUR INCH STROKE AND ESP ARMOR TREATMENT. HBEAM EAGLE RODS WITH A SIX-125 CENTER TO CENTER LENGTH, MAKE THE LINK TO A SET OF FORGED MAHLE PISTONS. THEY HAVE A ONE MILLIMETER, ONE MILLIMETER, TWO MILLIMETER RING PACK, GRAFEL COATING ON THE SKIRTS, AND ARE A SHELF STOCK PISTON. THE BLOCK REQUIRES SEVERAL GALLERY PLUGS, THERE ARE 16 FOR THE OIL PASSAGES ONLY. PAY ATTENTION TO YOUR BLOCK INSTRUCTIONS TO MAKE SURE YOU GET EVERYTHING IN WHERE IT'S SUPPOSED TO BE. WE'VE NEVER BEEN ONES TO STICK TO TRADITION WHEN IT COMES TO PAINTING ENGINE BLOCKS. THIS MAYBE THE BIGGEST DEPARTURE YET. THE ENGINE'S AUTOMATICALLY GONNA MAKE MORE TORQUE. YOU KNOW WHY? 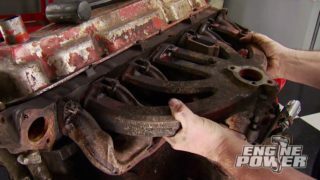 IT'S GOT TO MAKE BIG DIESEL TORQUE IF WE PAINT IT DUPLICOLOR'S CUMMINS BEIGE. THIS COLOR WILL ALSO LET A LEAK BE FOUND QUICKLY IF ONE DOES COME UP. (MIKE)>> SINCE THIS IS A PURPOSE BUILT ENGINE AND WE WILL BE PUTTING IT THROUGH THE RINGER, WE'RE NOT SKIMPING ON ANY OF THE PARTS. THAT INCLUDES THE TIMING SET. INSTEAD OF A CHAIN LIKE THIS WE WILL BE RUNNING A JESEL BELT DRIVE. NOW THE BENEFITS ARE MORE ACCURATE CAM AND IGNITION TIMING, AN INCREASE IN STRENGTH, AND EASE OF ADJUSTABILITY. HERE'S A RUNDOWN OF HOW THE JESEL BELT DRIVE INSTALLS. FIRST A SLIM BEAD OF THE RIGHT STUFF FROM PERMATEX WILL BE APPLIED TO THE BLOCK. NOW THE JESEL TIMING COVER IS INSTALLED. IT HOUSES A TEFLON COATED HIGH VACUUM CRANK SEAL. BELT DRIVE SETUPS DO NOT USE LUBRICATION FROM THE ENGINE. A LITTLE MORE RTV IS PLACED ON THE RECESSED AREA OF THE CAM ADAPTOR. ENGINES WITH HIGH VACUUM CAN GET BY WITHOUT THE SILICONE. WE'RE NOT RUNNING A VACUUM PUMP. SO THIS WILL PREVENT A LEAK. WITH A THIN FILM OF OIL ON THE OUTER BRONZE THRUST WASHER, IT CAN BE PLACED OVER THE NOSE OF THE CAM ADAPTOR. NOW THE ERSON HYDRAULIC ROLLER CAM SHAFT IS SLID INTO THE BLOCK. THE CAM TUNNEL IS RAISED 134 THOUSANDTHS, AND HAS A 55 MILLIMETER BABBITT CAM BEARING BORE. (PAT)>> HERE'S A LOOK AT THE CAM CARD. WE HAD THIS CUSTOM GROUND DIRECTLY FROM ERSON. NOW WE NEED TO DETERMINE THE CAM SHAFT'S END PLAY. THAT REQUIRES PLACING ALL THREE THRUST SHIMS AND A THRUST PLATE IN PLACE. NOW TIGHTEN A COUPLE OF NUTS, AND CHECK THE END PLAY. IT SHOULD BE BETWEEN EIGHT AND 12 THOUSANDTHS. (MIKE)>> TO PREVENT OIL LEAKING THROUGH THE SHIM PACK A VERY THIN FILM OF SILICONE IS PUT ON THEM. THIS WILL ADD A LITTLE THICKNESS, BUT AS LONG AS THE END PLAY IS STILL IN RANGE IT'S GOOD TO GO. WITH THE CRANK SNOUT LUBRICATED AND A LITTLE MORE RTV SILICONE TO PREVENT SEEPAGE, THE PULLEY IS TAPPED INTO PLACE USING A GEAR DRIVER. NOW THE WOODRUFF KEY IS INSTALLED, ALONG WITH THE IDLER. THE BELT IS ROUTED AROUND THE LOWER PULLEY AND TO THE INSIDE OF THE IDLER. THEN THE UPPER PULLEY ASSEMBLY IS LINED UP WITH THE TIMING MARKS. FINALLY THE CAM ADAPTER WASHER AND SEVENSIXTEENTHS BY 20 LEFT HANDED BOLT CAN BE TORQUED TO 70 POUND FEET. KEEP IN MIND, ENGINES WITH A BIG STROKE CRANK SHAFT AND A LARGE CAM CORE CAN HAVE CLEARANCE ISSUES. TURN THE ENGINE OVER BY HAND TO MAKE SURE EVERYTHING CLEARS. 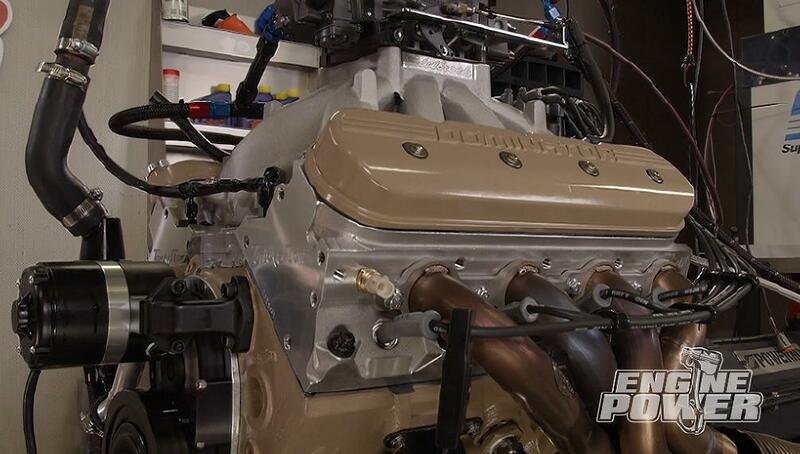 (NARRATOR)>> UP NEXT, THE MOTOWN GETS DOWN WITH BILLET LIFTERS, HIGH FLOWING HEADS, AND A MASSIVE INTAKE MANIFOLD. WE'RE EXPECTING GOOD THINGS ON THE DYNO. (PAT)>> WELCOME BACK. 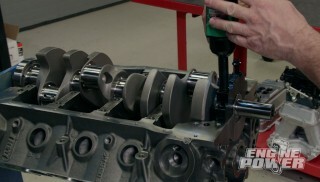 BEFORE WE GO ANY FURTHER ON OUR TRIPLE THREAT CAMARO ENGINE WE NEED TO DEGREE THE CAM. THIS LETS US PUT THE INTAKE CENTER LINE EXACTLY WHERE WE WANT IT. IN THIS CASE IT'S INSTALLED TWO DEGREES ADVANCED AT 112 DEGREES. NEXT IS THE MELLING HIGH VOLUME OIL PUMP. THE PICK UP HAS BEEN TACK WELDED IN PLACE FOR EXTRA INSURANCE. IT'S ALWAYS COMMON PRACTICE TO MEASURE THE PICK UP'S DISTANCE FROM THE PAN RAIL TO VERIFY ITS CLEARANCE IN THE OIL PAN. 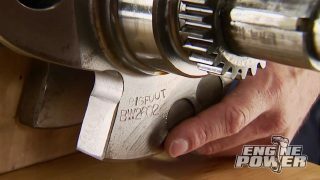 (MIKE)>> WITH THAT CHECKING OUT RIGHT, A LITTLE BIT OF RIGHT STUFF GASKET MAKER IS PUT IN THE CORNERS TO WARD OFF ANY POTENTIAL LEAKS. THEN A ONE PIECE STEEL REINFORCED RUBBER GASKET IS LAID INTO PLACE. BE SURE TO SEAL UP THE UNUSED DIP STICK HOLE IN THE GASKET. A LITTLE MORE GASKET MAKER ON THE ENDS, AND OUR CANTON ROAD RACE OIL PAN DROPS ONTO THE BLOCK. IT'S FULLY TRAP DOORED AND BAFFLED, AND HAS AN OIL CAPACITY OF EIGHT QUARTS. IT ALSO FEATURES A BUILT IN WINDAGE TRAY. TO COMPLIMENT OUR ERSON HYDRAULIC ROLLER CAM WE HAVE A SET OF TIE BAR STYLE PRO RACE SERIES HYDRAULIC ROLLER LIFTERS MADE FROM BILLET ALLOY STEEL. FOR FASTENERS WE ALWAYS RELY ON ARP FOR ALL OUR PROJECTS BECAUSE THEY PERFORM BEYOND OUR HIGHEST EXPECTATIONS. (PAT)>> ROYAL PURPLE BREAK IN OIL LUBES THE ROLLERS AS THEY DROP INTO POSITION. THESE ARE 842 THOUSANDTHS IN DIAMETER. MORE RIGHT STUFF IS PUT ON THE CHINA RAIL, AND THE VALLEY ADAPTER IS BOLTED DOWN. THIS MAKES WAY FOR INSTALLING OUR COMETIC MLS HEAD GASKETS. THE MULTI LAYER STEEL DESIGN HAS A FOUR-200 BORE, AND A 30 THOUSANDTHS COMPRESSED THICKNESS. AFTER LUBING THEM WITH SOME ARP ULTRA TORQUE, THE STUDS ARE THREADED INTO THE BLOCK. IN MOST CASES WE PUT THE STUDS IN AFTER THE HEAD IS ON TO AVOID GETTING ALUMINUM ON THE THREADS, BUT BECAUSE THERE ARE ONLY 10 SHORT STUDS THE HEADS CAN BE INSTALLED CAREFULLY WITH THE STUDS IN PLACE. (MIKE)>> THE TRICK FLOW GENX 260 LSSEVEN HEADS COME NEXT. THEY ARE TORQUED IN THREE STAGES. FIRST TO 30 POUND FEET, THEN 50 POUND FEET FOR THE SECOND, AND FINALLY TO 80 POUND FEET. NEXT AN SFI APPROVED HARMONIC DAMPENER FROM POWER BOND SLIDES ON. IT'S SAFETY RATED TO 12,500 RPM. A MATCO BALANCER INSTALLER MAKES QUICK WORK OF THE JOB WITH NO HAMMERING REQUIRED. AN ADJUSTABLE BILLET TIMING POINTER, WHICH FITS OUR EIGHT BALANCER, BOLTS INTO THE TIMING COVER. WITH THE CYLINDER HEAD OFF, IT'S EASY TO SET TRUE TDC WITH AN INDICATOR AND A PISTON STOP. 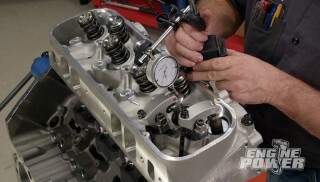 (PAT)>> WE'LL INSTALL THE HEAD FOR MOCK UP PURPOSES WITH CHECKER SPRINGS IN THE NUMBER ONE CYLINDER. AN ADJUSTABLE PUSH ROD IS UTILIZED TO MEASURE FOR PROPER PUSH ROD LENGTH. TO DETERMINE THAT LENGTH THE CAM MUST BE ON ITS BASE CIRCLE. THEN THE PUSH ROD IS EXTENDED UNTIL ALL THE LASH IS TAKEN OUT AND THERE IS NO CLEARANCE BETWEEN THE PUSH ROD CUP AND THE END OF THE PUSH ROD. THE PUSHROD IS CAREFULLY REMOVED AND MEASURED FOR LENGTH. WE WILL ORDER A SET OF SEVEN-900 PUSH RODS FOR THE ENGINE. THE CROWN JEWEL TO ANY WELL DESIGNED INDUCTION SYSTEM IS THE INTAKE MANIFOLD. 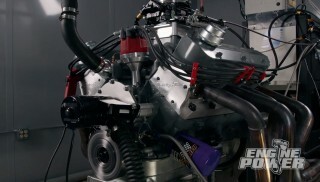 THIS IS EDELBROCK'S SUPER VICTOR LS SEVEN INTAKE. NOW THIS IS 750 THOUSANDTHS TALLER THAN THEIR LS THREE SUPER VICTOR, AND IT IS SETUP FOR A MASSIVE 4,500 SERIES DOMINATOR CARBURETOR. 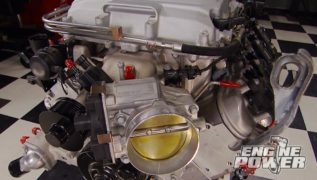 IT'S OPERATING RANGE IS FROM 3,500 TO 8,500 RPM, AND AS FAR AS HORSEPOWER IS CONCERNED THIS MANIFOLD IS CAPABLE OF MAKING OVER 800 HORSEPOWER IN NATURALLY ASPIRATED FORM. WITH THE INTAKE ON, THIS ENGINE IS REALLY TAKING SHAPE. (NARRATOR)>> UP NEXT, A COUPLE OF FINISHING TOUCHES AND THIS ENGINE'S READY TO ROCK! (MIKE)>> WELCOME BACK. WE DECIDED TO PAINT THESE HOLLEY DOMINATOR VALVE COVERS THE SAME CUMMINS BEIGE AS THE BLOCK. NOW WE WANT TO MOVE ON AND SHOW YOU A LITTLE MORE ABOUT THE CYLINDER HEADS THAT ARE ON THIS MOTOWN LS. 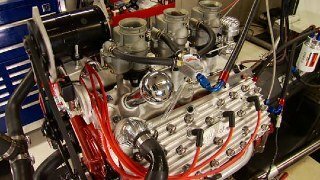 THEY'RE TRICK FLOW'S GENX 260 FOR LSSEVEN ENGINES. THE VALVE SIZES ARE TWO-200 ON THE INTAKE AND ONE-600 ON THE EXHAUST. THEY HAVE A 70cc COMBUSTION CHAMBER THAT IS CNC MACHINED. THE INTAKE RUNNER VOLUME IS 260cc, AND THE EXHAUST MEASURES IN AT 87cc. THEY COME WITH DUAL PACKED VALVE SPRINGS AND TITANIUM RETAINERS. THEY CAN ONLY BE USED ON LS ENGINES WITH A FOUR-100 MINIMUM BORE DIAMETER. HERE'S A LOOK AT THE FLOW SHEET DIRECTLY FROM TRICK FLOW. WITH NUMBERS LIKE THESE, THIS HEAD WILL MAKE POWER ON ANY COMBINATION. EVEN OURS ON PUMP GAS AND NATURALLY ASPIRATED. WE EXPECT TO SEE NUMBERS DEEP IN THE 600 RANGE. (PAT)>> OUR PUSH RODS ARRIVED FROM TRENT PERFORMANCE. THEY ARE SEVEN-900 IN LENGTH WITH 105 THOUSANDTHS WALL THICKNESS. THEY ARE FIVESIXTEENTHS IN DIAMETER WITH A FIVESIXTEENTHS BALL ON EACH END, AND THEY ARE FULLY HARDENED FOR DURABILITY. OUR VALVE TRAIN NEEDS TO BE AS DURABLE AS THE REST OF THE ENGINE. SO WE CHOSE A JESEL SHAFT ROCKER SYSTEM. WITH THE STAND BOLTED DOWN, THE HEAVY DUTY ONE POINT EIGHT RATIO ROCKERS GO ON INDIVIDUALLY. (MIKE)>> LIGHTING THE AIR/FUEL MIX IS A SET OF ETHREE DIAMOND FIRE SPARK PLUGS. NO GAPPING OR INDEXING IS REQUIRED. NEXT A SET OF MSD EIGHT AND A HALF MILLIMETER SUPER CONDUCTOR WIRES, WHICH WILL HOOK UP TO OUR MSD BLACK SERIES BILLET DISTRIBUTOR. IT COMES LOCKED OUT WITH A BRONZE GEAR ALREADY INSTALLED FROM MSD. 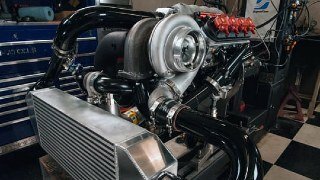 EFFICIENTLY MIXING THE AIR AND FUEL IS A HOLLEY XP 10-50 ULTRA DOMINATOR. THIS IS ANOTHER ONE OF OUR TEST CARBURETORS THAT RUNS GREAT ON ANY ENGINE WE PUT IT ON. (PAT)>> TO LUBRICATE THIS STOUT BULLET WE'LL USE EIGHT QUARTS OF ROYAL PURPLE XPR IN FIVEW-30. IT'S DESIGNED TO HANDLE HIGH HORSEPOWER RACE APPLICATIONS. A ROYAL PURPLE OIL FILTER FINISHES IT OUT. (MIKE)>> ALL RIGHT EVERYBODY, WE'RE IN THE LIE DETECTOR CHAMBER WITH OUR 440 CUBIC INCH MOTOWN LS. WE'VE ALREADY RAN IT QUITE A BIT MAKING SURE THE RINGS WERE SEATED AND THE CARBURETOR IS ALL DIALED IN. 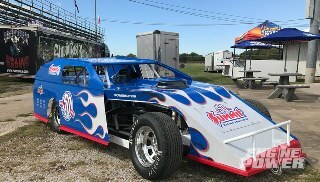 NOW IT'S TIME FOR PAT TO MAKE SOME PULLS AND SEE WHAT THIS THING WILL MAKE. (MIKE)>> SHE'S MAKING SOME STEAM BROTHER! 624 ON POWER, 546 ON TORQUE. (MIKE)>> DID YOU SEE THE NEEDLE ON THE RED GAUGE? (PAT)>> LET'S SEE WHAT IT COMES UP. (MIKE)>> 671, 557! 671 HORSE ON 24 DEGREES OF TIMING. (PAT)>> ON 93 OCTANE. THAT IS ABSOLUTELY INCREDIBLE, AND WE'RE JUST GETTING STARTED. (NARRATOR)>> UP NEXT WE'RE PRETTY SURE THIS ENGINE'S GOT A FEW MORE PONIES IN IT, AND WE'RE GONNA LOOK FOR THEM. 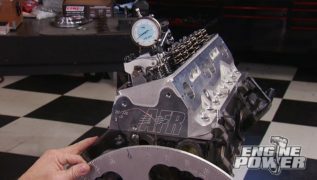 (MIKE)>> 674 WITH A THREE AND 558 ON TORQUE. (PAT)>> OKAY, THAT'S NOT SURPRISING BECAUSE THESE HEADS ARE SO GOOD AND THE CHAMBER IS SO GOOD. FLAT TOP PISTONS. IT'S NOT GONNA REQUIRE A BUNCH OF TIMING. 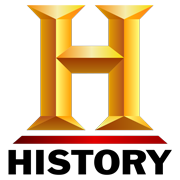 (MIKE)>> 676, 561, IT PICKED UP TWO NUMBERS. (PAT)>> IT DID PICK UP A LITTLE. RIGHT THERE AT 26 IT'S GOT TO HAVE A TINY BIT OF RUN OUT, WHICH MEANS IT'S THAT CLOSE TO DETONATION. LET'S MIX UP A LITTLE GAS FOR IT. 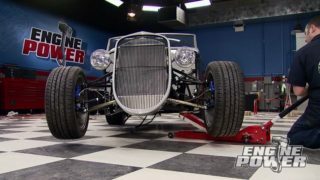 (MIKE)>> ALL RIGHT, PICKED UP ONE AND A HALF, 677 WITH A FIVE AND 561 ON TORQUE. (PAT)>> THAT'S PRETTY SPORTY. I DON'T THINK, I EVEN HATE TO SAY THIS, I DON'T THINK WE HAVE MUCH MORE IN IT WITH THE PARTS WE HAVE IN IT. IF THIS WERE A MORE DRAG RACE ORIENTATED DEAL, A SOLID CAM WITH A LITTLE BIT MORE AGGRESSIVE CAM, BECAUSE I'LL BE QUITE HONEST WITH YOU, I UNDER SHOT THE CAM ON IT. THAT'S EASY TO CHANGE WITH THE SETUP WE HAVE. WE MAY STILL DO THAT. 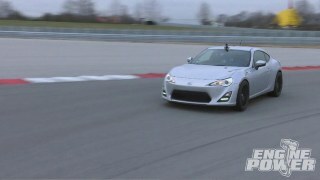 THIS THING MAKES ONE POINT FIVEFOUR PER CUBE ON PUMP GAS, AND THEN A LITTLE RACY GAS IT PICKED IT UP A LITTLE BIT MORE. SO AWESOME ENGINE! (MIKE)>> WINWIN! YOU KNOW WHAT'S EVEN BETTER? IT'S GOING IN THE SPLIT BUMPER. (PAT)>> YEAH! FOR MORE INFORMATION ON ANYTHING YOU'VE SEEN TODAY GO TO POWERNATION TV DOT COM. MAHLE AFTERMARKET IS A TECHNOLOGY LEADER IN THE INDUSTRY, AND THEY'VE BEEN WORKING WITH PROFESSIONAL RACE TEAMS AND TOP ENGINE BUILDERS ALL OVER THE GLOBE TO DEVELOP A NEW LINE OF PERFORMANCE PRODUCTS FROM THE GROUND UP. ONE OF THEIR NEWEST PRODUCT LINE IS PERFORMANCE GASKETS. STARTING FROM SCRATCH, THEY HAVE BUILT A COMPREHENSIVE CATALOG OF SEALING TECHNOLOGY, WHICH INCLUDES MLS HEAD GASKETS, REINFORCED INTAKE AND EXHAUST GASKETS, AND VALVE COVER AND OIL PAN GASKETS. MAHLE COVERS WIDE VARIETY OF APPLICATIONS FROM JUST ABOUT ANY POPULAR HOT ROD ENGINE TO DEDICATED RACE BULLETS, AND TO SEAL UP YOUR HIGH PERFORMANCE RIGHT GO TO MAHLE AFTERMARKET DOT COM. (MIKE)>> A VEHICLE LIFT IS A MECHANICS BEST FRIEND. WITHOUT ONE WORK WILL TAKE LONGER, IS HARDER, AND IT'LL TAKE A TOLL ON YOUR BODY FROM HAVING TO CLIMB IN AND OUT FROM UNDERNEATH THE CAR. NOW WE USE DANMAR LIFTS IN THIS SHOP, AND THIS IS A 10 ACX THAT HAS A 10,000 POUND WEIGHT CAPACITY. IT HAS SINGLE PIECE COLUMNS FOR ADDED STRENGTH AND IS ALI AND ETL CERTIFIED. TRUCK AND VAN ADAPTERS ARE INCLUDED, AND SAFETY LOCKS ARE IN EACH COLUMN WITH SPACING EVERY FOUR INCHES. A THREE YEAR EXTENDED WARRANTY ON PARTS AND LABOR IS SUPPLIED WITH THE LIFT. LOG ON TO GARAGE EQUIPMENT SUPPLY AT GES USA DOT COM FOR MORE INFO. (PAT)>> KEEP IN MIND, BOTH SINGLE AND DOUBLE ROW TIMING SETS WILL STRETCH OVER TIME, AND THAT JUST WON'T EFFECT THE CAM TIMING. IN EXTREME CASES IT WILL VARY THE IGNITION TIMING AS MUCH AS THREE OR FOUR DEGREES, AND AT THAT POINT THE ENGINE IS DANGEROUSLY CLOSE TO A CATASTROPHIC FAILURE BECAUSE THE CHAIN IS READY TO BREAK. AS FAR AS MATERIALS GO, MOST HOT ROD TYPES ARE MADE OUT OF REGULAR CAST IRON, BUT THE PINNACLE OF TIMING SETS ARE THE BILLET TYPE BOTH ON THE CRANK AND CAM GEAR. NOW THESE ARE TYPICALLY FULLY ADJUSTABLE AND COME WITH A TORRINGTON BEARING ON THE BACK TO REDUCE WEAR ON THE BLOCK. IN SOME CASES THE TORRINGTON HAS TO BE MACHINED FOR, BUT FOR THE MOST PART THEY ARE INTEGRAL IN THE DESIGN FOR YOUR PARTICULAR APPLICATION. IF YOU WERE AROUND HOT RODDING IN THE '80'S, THEN YOU PROBABLY REMEMBER HEARING WHAT A GEAR DRIVE SETUP SOUNDS LIKE AT YOUR LOCAL CRUISE NIGHT OR DRAG STRIP. NOW THERE ARE ADVANTAGES AND DISADVANTAGES OF A GEAR DRIVE. ON THE GOOD SIDE THEY ARE EXTREMELY ACCURATE IN CONTROLING THE POSITION OF THE CAM SINCE THERE IS NO STRETCH INVOLVED. THE DOWN SIDE IS THEY ARE SLIGHTLY TO OBNOXIOUSLY NOISY IN THEIR OPERATION, AND INDUCE MECHANICAL RESONANCE INTO THE VALVETRAIN, SOMETIMES CAUSING ISSUES IN EXTREME PERFORMANCE APPLICATIONS. THEY'RE STILL AVAILABLE FOR POPULAR ENGINE COMBINATIONS, AND IF YOU LIKE THAT HIGH PITCHED WHINE LIKE AN OIL SCHOOL BLOWER, WELL THEN THESE ARE THE HOT TICKET. THE ULTIMATE TIMING SETUP IN MY OPINION IS A BELT DRIVE SETUP. THESE ARE SPECIFICALLY ENGINEERED TO PROVIDE ACCURATE CAM TIMING, PROVIDE EASE OF ADJUSTMENT, AND HAVE GREAT LONGEVITY, WITH THE SIDE BENEFIT OF DAMPENING HARMONICS TO THE VALVETRAIN. ALTHOUGH THEY ARE IN THE TOP END OF THE BUDGET THEY DO PROVIDE THE VERY BEST OF EVERY FEATURE THAT YOU'D WANT FOR YOUR HIGH END RACE BULLET. 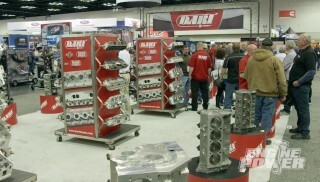 THEY'RE AVAILABLE THROUGH SEVERAL MANUFACTURERS AND FOR ALL POPULAR RACE ENGINE PLATFORMS.